Why would I heat my home with wood? Sick of paying high propane prices? Tired of high oil, natural gas and propane bills? If you live in an area of Wisconsin with an ample supply of softwood or hardwood, you know how available wood is for camp fires, wood stoves, fireplaces and home heating. 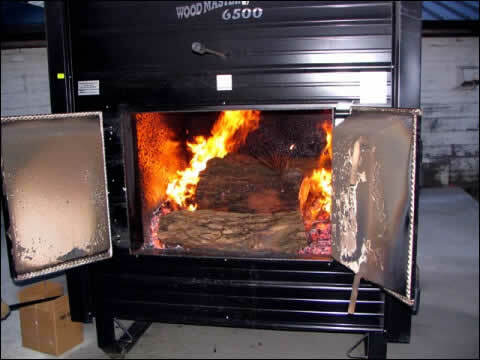 Why not utilize that wood to save money for years and years from a renewable source of fuel? Eliminate your fuel bills and retrofit your home with a new long-lasting outdoor wood burner boiler. Once you’re sold on this cozy, renewable source of fuel, you can also use your outdoor wood burner boiler for heating your water, garage shop, workshops, agricultural buildings, barns, riding arenas, pools and hot tubs. How does an outdoor wood burner boiler work? Outdoor wood stove or burner boilers are located outside of your home, much like your propane tank, making them easy to refill with your supply of hardwood and softwood. The outdoor wood burner boiler heats water, which is transferred to a heat exchanger inside your home. The heat exchanger then delivers a warm, cozy heat throughout your home. Outdoor wood burner boilers can also be installed with a programmable thermostat, ensuring consistent warmth in your home that is also efficient. Outdoor wood burner boilers can heat your home’s hot water supply as well. Existing homes currently dependent upon propane, oil or natural gas can easily be retrofitted for an outdoor wood burner boiler. Whether you currently have forced air or hydronic heating, outdoor wood burner boiler models can be installed to replace your old furnace or boiler. Outdoor wood burner boilers can easily be fitted to an existing hydronic radiant floor heating system for any room of your home---or for your garage shop, workshop, agricultural building, barn or milking parlor. What other buildings are ideal for wood burner boilers? Outdoor wood stove or burner boilers are ideal for home heating, and also an excellent heating source for your garage shop, workshop, agricultural building, barn or milking parlor. Want to fuel your radiant floor heating for virtually no cost? Install a wood burner boiler outside your garage or barn and fit it to your hydronic radiant floor heating system, then enjoy the even, cozy heat of underfloor heating and the benefits of a dry floor. Outdoor wood stove or burner boilers are also ideal for riding arenas and barns where your animals are kept. Why pay for propane, oil or natural gas to heat your riding arena? Install an outdoor wood burner boiler outside your riding arena, and enjoy riding your horses, or giving lessons all year long regardless of the cold Wisconsin temperatures.